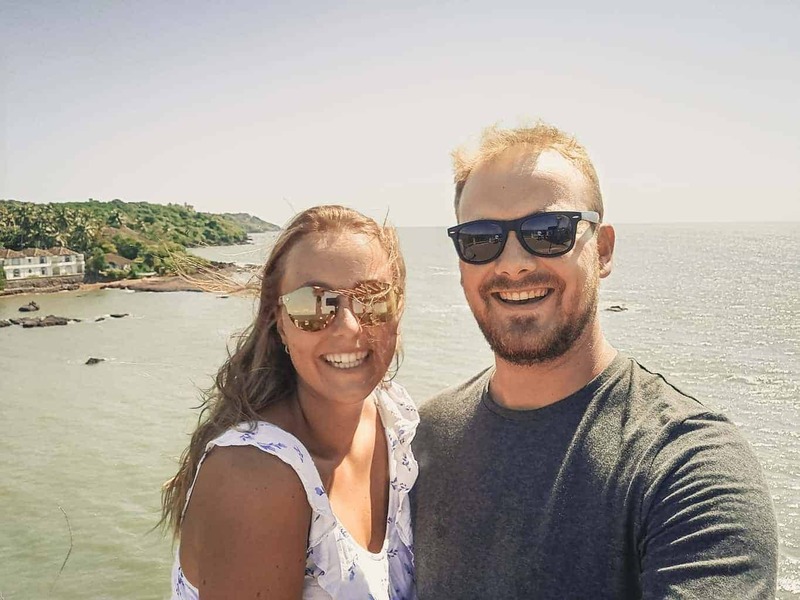 Sri Lanka was the first stop when we left on our 1-year honeymoon in 2018. We’ve tried to see as much as possible in this amazing country in 3 weeks. 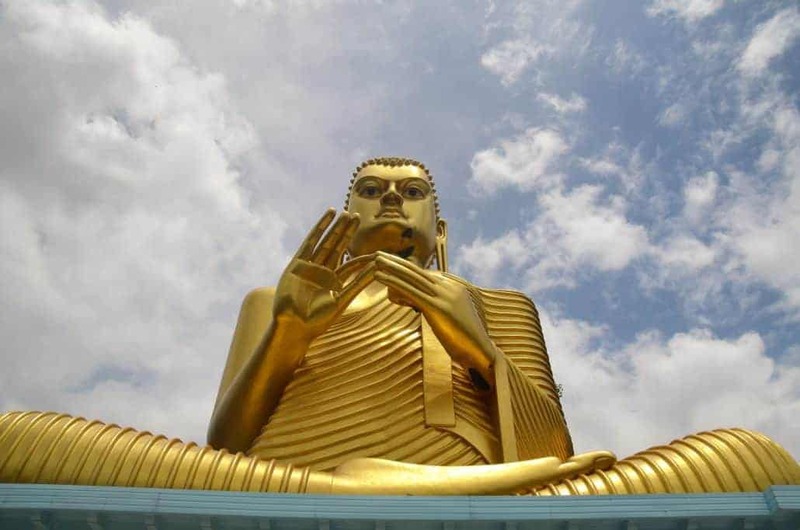 Below you can find our journey with a detailed day by day itinerary of Sri Lanka. You can follow our journey in both ways. You’ll start and end with lovely beach views. The way we did it, we had some more beaches at the end and a bit more culture in the beginning. Would you rather just watch the after movie? We spend € 596.50 for the 2 of us, €817.93 if we add the activities. That is €13,56 per person per day (€18.59 with activities). This is without flights, as these prices will depend on where you leave. We only stayed one night in a hostel, all of the other stays were in a private room (either guesthouses or hotels). Length of stay: 2 days. Only stay for 2 days if you don’t like to travel with a jetlag and want to lay by the swimming pool/sea. Otherwise, 1 day is enough for Negombo. Where we stayed: Winston beach hotel. A nice hotel, you can use the (very clean) pool of the hotel next door if you drink something whilst enjoying the sun & swimming pool. How we got there: Tuktuk from the airport (700 LKR, should’ve been around 500). If you want to have good tuk-tuk prices all the time you should install the app PickMe Sri Lanka! Stroll through the city centre or at the beach. Nowhere special, it’s very touristic when it comes to restaurants. Lots of western food (and western prices). If you want something local, try one of the seafood restaurants in the southern part of the city (near the fish market) for amazing fresh fish. Where we stayed: Lak View Family Resort. Yes Lak.. the lake was not in sight, but the owner is very friendly and helpful. How we got there: Bus from Negombo bus terminal (Google maps) to Kurunegala (100 LKR pp) and Kurunegala to Dambulla (95 LKR pp). Blog post for the bus journey. Pidurangala rock or lion rock. The owner of Lak View drove us all the way to the rocks in Sigiriya (for 2300 LKR). It will be cheaper if you go from Polonnaruwa. Pidurangala costs 500 LKR pp, lion rock is 30 dollar pp (4500 LKR) or 15 dollar/2250 LKR pp if you’re from a SAARC country. Where we stayed: Udesh Guest house. Probably the cleanest place we stayed at during the 3 weeks. Highly recommend! There are also 20-30 little parrots in his garden in the morning as he feeds them every day. How we got there: The owner of Lak view drove us for free (from and) to the bus station, from there we took the bus to Polonnaruwa. Jumped off the bus somewhere along the road, as close to Udesh as possible and then walked another kilometre. Make sure your legs and shoulders are covered or you won’t get in. We rented a bike from Udesh for 400 LKR pp. The ruins are too big to walk around. You could also rent a tuk-tuk with a guide, but you should be fine without a guide too. Watch out for monkeys, they try to steal stuff in exchange for food. 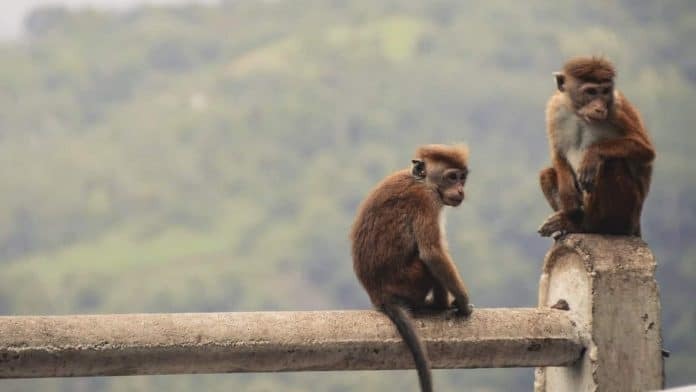 We saw a monkey snitch an iPhone and walk away with it until all of his friends had gotten enough food.. and then he returned it with a broken screen. Other than that there’s not much to see in Polonnaruwa. We’ve eaten local Kotthu and rice at Udesh, it was delicious and cheap! How we got there: The owner of Udesh arranged us a tuk-tuk to the bus station of Polonnaruwa (500 LKR) and there we took a direct bus to Kandy (200 LKR). Please don’t ride on elephants or support orphanages that allow it! Where we stayed: The Galways Edge Homestay. They are the nicest people, ever. Their English is not that good, but they were soooo nice to us! They even gave us flowers when we arrived as it’s our honeymoon. How we got there: The train from Kandy to Ella (Nanu Oya is a stop of that train near Nuwara Eliya). The Royal Turf Club (a horse ranch – Google maps). The horses are just freely roaming around (even on the streets)! The vegetarian hotel. No, we kid you not. It’s a restaurant, not a hotel, and has amazing food. This is 1 of the 27 things we found that were odd in Sri Lanka. 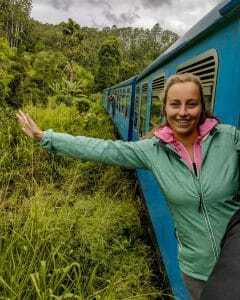 How we got there: The second part of the Kandy – Ella train ride. Even more amazing views! 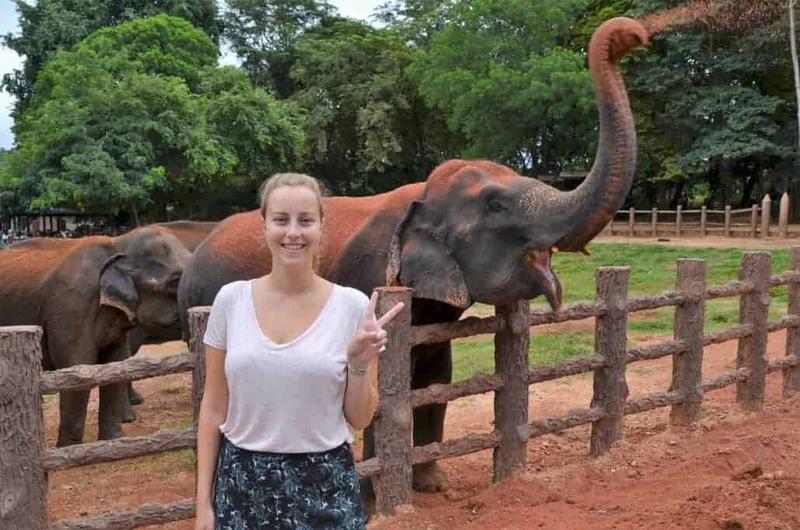 Ella is a beautiful mixture between touristic and local. The centre is very touristic and has a vibrant nightlife. Competitive prizes with happy hours etc. The nine arches bridge is stunning. Wait for a train to pass to get those nice pictures. Don’t fly your drone. Apparently, it’s not allowed as there are bees under the bridge who’ll attack your drone first and the people afterwards! The chill café looks incredible, it resembles a huge hut and has delicious food and drinks (Try a cocktail with Arrack, the local spirit). Where we stayed: 20 House Arugam. It’s not really located in Arugam Bay but in Pottuvil. The main beach in Arugam Bay is only 800 meters away though. 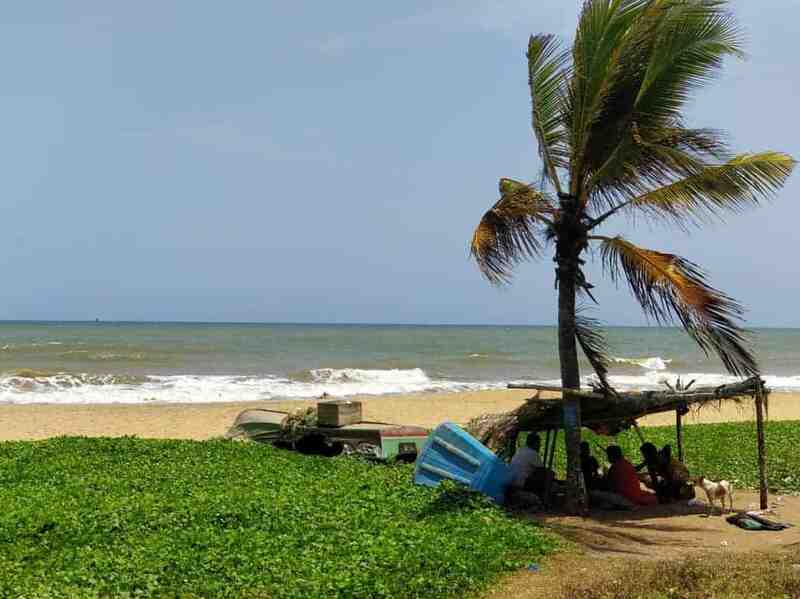 How we got there: We took a bus from Ella to Monaragala and from there another one to A’Bay. Surfing! 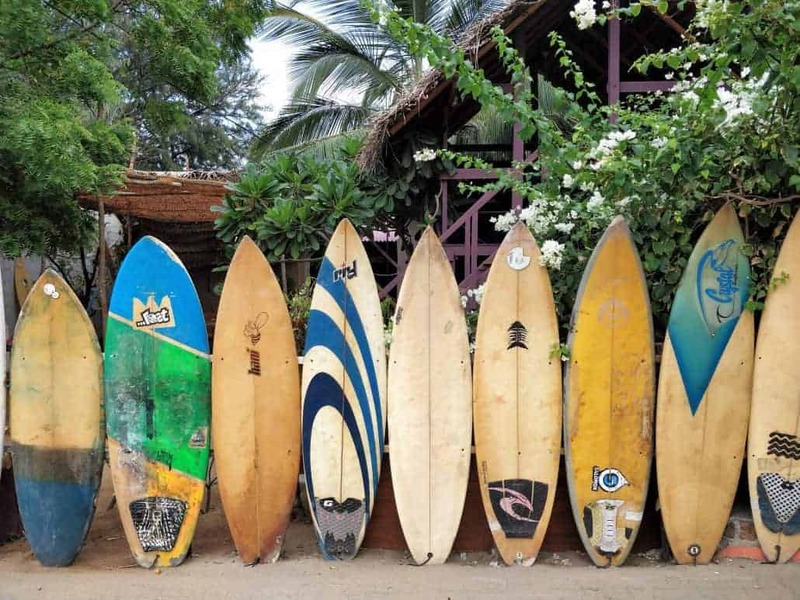 It’s one of the best surfing spots in the world, so don’t miss out on this one (check the current prices at the surf shops). Take a full or half day safari. We did half a day safari to Kumana national park (external link) with Umam. Just send him on WhatsApp or contact him via email. If you want local food you should go to the neighbouring city of Pottuvil. It’s very good food and super cheap. The best place we ate was Sbarro next to the supermarket (right in front of the second gas station if you come from Arugam Bay). How we got there: We didn’t want to take the bus from Arugam Bay all the way to the south coast in one go, so we decided to stay 1 night in the middle of both cities. Wellawaya is where we should’ve switched busses, so that seemed the logical place to stay. There’s not much to do here, but that’s when you really meet the locals (and their delicious food)! There are lots of buses going to Galle from Wellawaya. Mirissa is one of the stops on this journey. Don’t listen to the tuk-tuk drivers as they’ll say there’s no place on the bus. This is true when people are leaving for work, but if you just wait until noon and you’ll be able to sit. Let’s go to the beach, each, let’s go get away. 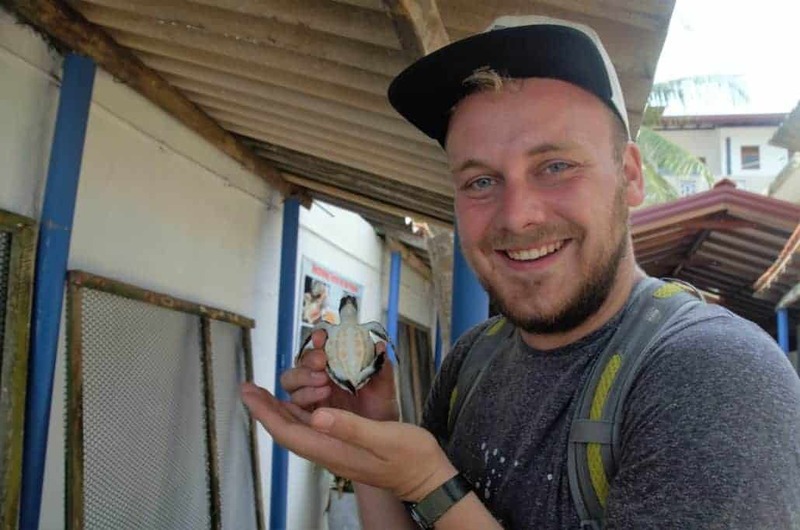 Visit the Sea Turtle hatchery in Habaraduwa. There are some great local places to eat in the street parallel to the beach. Restaurants at the beach are nice if you want to have dinner near the ocean, but we didn’t like the quality of the food there. We’ll prefer local food over touristic places. With pizza being the only exception. Because pizza is heaven. How we got there: just take any bus going to Galle. Unawatuna is one of the stops between Mirissa and Galle. The main beach is clean, the waves are not too strong and the water is clear. When we were there, there was a playful turtle swimming at the coast. Jungle beach. It’s quite a walk, but it’s definitely worth the visit. There will be a few locals and probably no tourists around you if you go early in the morning. There are a lot of cosy bars in Unawatuna. Chill atmosphere, not too expensive and lots of healthy food options. The pink elephant! Delicious food at cheap prices. 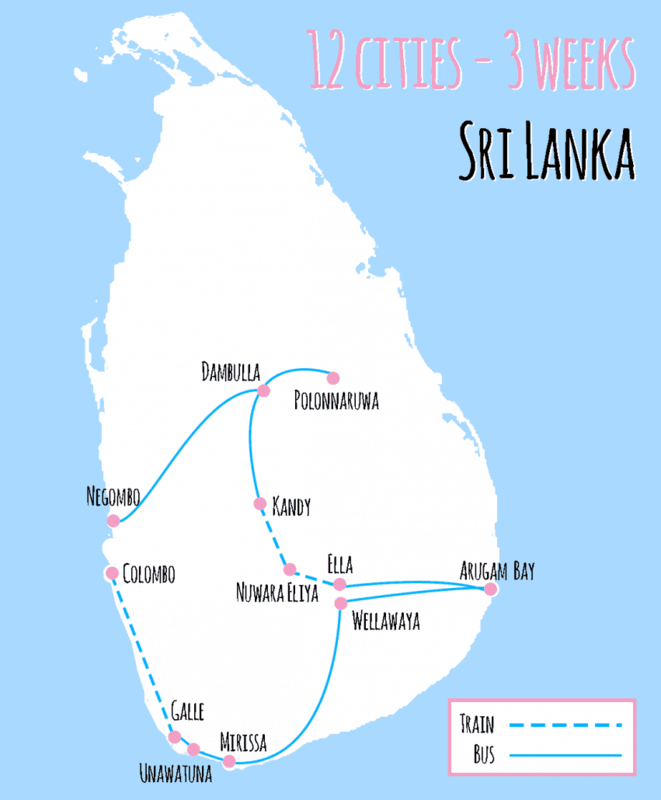 How we got there: Just take any bus from Unawatuna to Galle. In Sri Lanka, people celebrate the full moon every month by going to the temple. Most non-governmental places will be closed as people are praying! It is called ‘Poya day’. 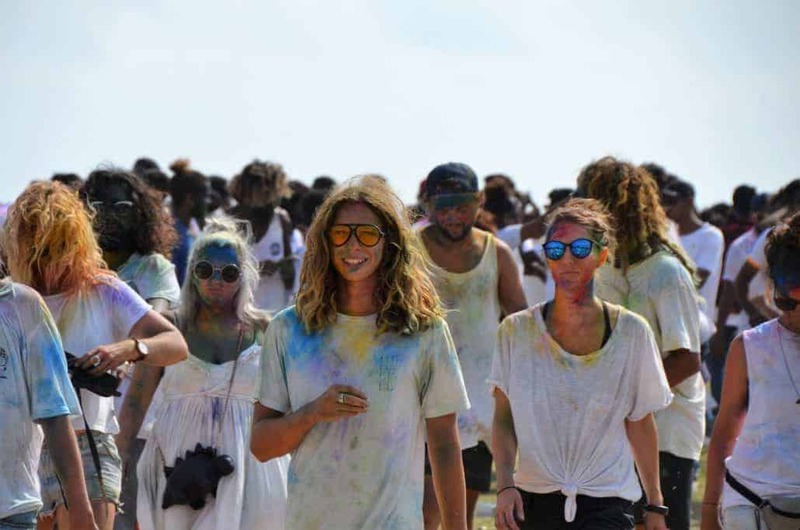 In Galle however, people are celebrating Poya day with a ‘colour festival’ named Holi. We cooked some pasta at our guesthouse in Galle, but there are lots of nice restaurants in the fort! Where we stayed: Downtown Monkey Hostel. A clean hostel with 6 person rooms, close to the train & bus station. How we got there: We took the train from Galle to Colombo for 180 LKR pp, which is about €1 for a 2-hour train ride. Unfortunately, we hopped on a train with a cricket team on it already, so there was no more place to sit for us. 2 hours of standing in the aisle..
Sri Lanka is doing great efforts in upgrading their capital, Colombo. Unfortunately, that means lots of skyscrapers are rising along the coast too. Streets are remarkably cleaner than in the rest of the country. There are some great food stalls around the city (like the one near the red mosque). We have to admit we’ve also eaten a burger at Burger King, as Katrijn couldn’t resist.. Awesome blog. My partner and I have just arrived in Sri Lanka and this was a perfect go to place to help us get some ideas for our own journey. Thank you so much for these kind words, Brett. This is the reason why we keep the blog running! Thank you so much for this amazing post. My boyfriend and I are going on a 4-week trip to Sri Lanka mid-Feb and we definitely recognize ourselves in your way of traveling. Can’t wait to use your great tips! You make our prep so much easier & funnier. Hello Eve! Great to hear! In what way would you say you could recognize yourselves? In the comfortable backpacking and I feel you take your time to learn about the culture/locals instead of only checking boxes on a « must-see » list. I love that! Zalige reis! Al zoveel gezien & al een hele trip gedaan, het ziet er echt een toffe huwelijksreis uit. 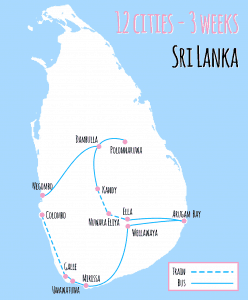 My boyfriend and I are heading to Sri Lanka in May for 3 weeks. Love your route and think it will definitely be a good base for us to start with. Was just wondering if you would know how to fit Adams peak into the list? And also one of the national parks. I’ve read that Yala national park is good around then but I’m unsure how to get there. Did you find that 3 weeks was enough time or were you rushing?